I’m going to outright say that, I do not like the police. I don’t trust them, and I wouldn’t call them for an emergency. Never again. I tried calling the police a few times when my narcopath ex was raging and going crazy. I never got any help. One officer in particular had it in for me and was verbally abusive with me. 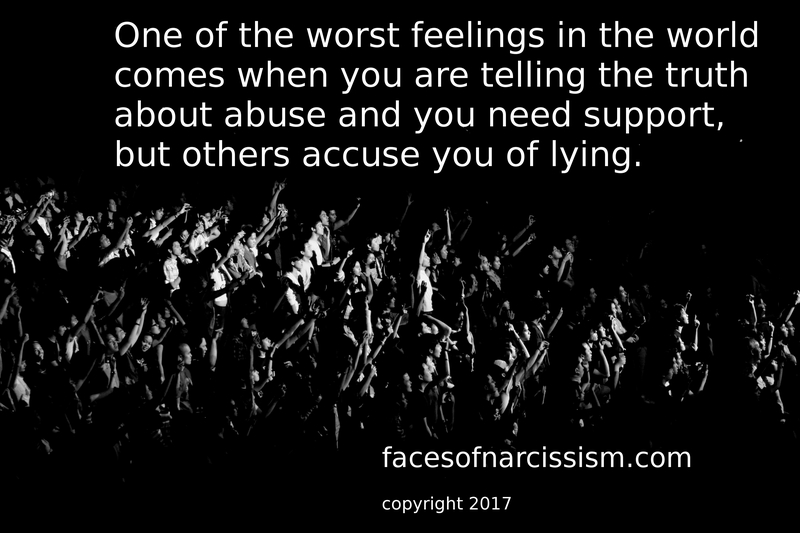 He screamed in my face every time, believed my abuser, told me I was a liar, told me the abuse was my fault for letting the abuser have a second chance…and threatened me not to waste his time again. I was horrified. In fact, I calmly called the police chief and explained that I felt like their officers needed better training. I explained that abuse is not always physical, but non-physical abuse often turns physical with time. I explained that abusers often calm down and play nice guy for the police, and that the victim who is crying and terrified is not “crazy.” The chief apologized and told me I should not be afraid to call again if the abuser got out of control. Lo and behold, the narcopath went into another severe rage–destroying my property and throwing things at me until I feared for my life. I called for help and to have the abuser removed from my home. The bullying officer showed up again and yelled at me, blaming me for everything and calling me a liar. I realized the police were never going to help and gave up on the idea. One last time, I gave my abuser a chance. He assaulted my toddler. I didn’t call right away, because the abuser told me if I did, he’d make it worth his time to be arrested. The insinuation was he would kill me. Of COURSE I didn’t call immediately. I protected my child and kept him next to me until the abuser left the next morning, and then I called to file the report. (FYI, I never let the abuser came back after that.) Unfortunately, the bully officer showed up again, and accused me of lying because my toddler didn’t have bruises. He decided I was also a liar because I didn’t call immediately after the assault. He put all of this in his report. Despite his lack of legal or psychological training, he wrote in the police report that I was mentally ill and making up stories. He was dead wrong, and it wasn’t his place to do that. I have since read horror stories about this happening to many abuse victims. He also reported me to children’s services saying I was delusional. They investigated me for a month then left me alone. 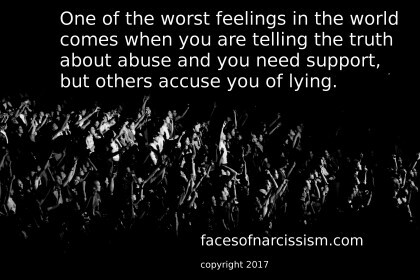 However, when the abuser later made false claims against me, all of the cop’s false reports were used as evidence and taken as truth. My kids were taken and I wasn’t allowed to see them for several weeks. CPS insisted I was sick and delusional. I gave them stacks of evidence showing the abuser’s history, but they didn’t care. They took that bad officer’s lies as facts and ignored reality. I couldn’t be alone with my kids for months, and they weren’t allowed home for 7 months. I went through hell. I truly believe that the intense stress and fear, (and trauma,) took years off my physical life. It couldn’t have been good for my heart. In the end, CPS recognized the abuse, but they never apologized, and nothing will make up for what damage they did to myself and my children. All because of one abusive officer’s false reports. One lie on the record creates a domino effect, and I was left helpless against a bureaucratic machine. The police failed us. CPS failed us. The courts failed us. And it all came down to one cop making judgement calls he wasn’t trained to make. One abuser in law enforcement who used his control to threaten me and later get revenge on me. My ex husband would say they won’t help you, they won’t come when I said I would call the police. And they had told me when I called previously they would only come if he was in the act of abusing me. Of course, he always left after the abuse going somewhere in his car for hours on end and never divulging where. So I suffered in fear for years. With my first ex, I was told to call the police every time he left a threatening phone message on my machine. He had been kicked out with a restraining order. However because it always happened at bedtime and I was told to be ready if they showed up I simply put a robe on that clearity covered me up. The men were sympathetic as they listened to me but one woman cop accused me of purposely dressing in a way to get attention and would not accept my explanation. Finally I made sure I was dressed when they came and she still accused me of being inappropriate in what anyone would consider normal attire. My ex had to show up in court for the restraining order hearing and after they let him cross question me pro se and put me through hell, then they cuffed him for all the messages. That was in OK. He went to jail for 6 weeks. The other incident was in MA. Today they say they will arrest someone if you even say someone assauted you but 18 years ago they told me they wouldn’t help. Progress is too d$$m slow.